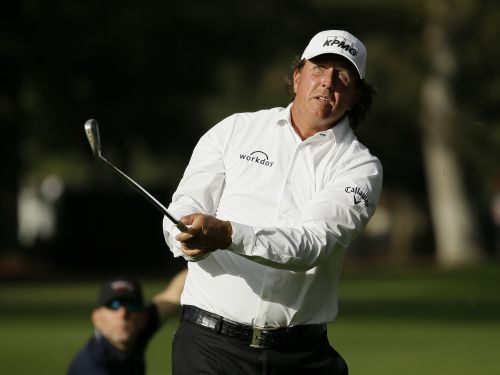 NAPA, Calif. (AP) — Phil Mickelson had six straight birdies and shot a 7-under 65 on Thursday to pull within two strokes of leader Sepp Straka in the PGA Tour's season-opening Safeway Open. Coming off a winless performance in the U.S. Ryder Cup loss to Europe, the 48-year-old Mickelson birdied Nos. 9-14 and closed with four straight pars on the North Course at Silverado Resort and Spa. I've been putting well, like I can putt," Mickelson said. "But I was surprised at some of the shots I've hit. Honestly, I hit it just terrible and today was kind of an anomaly. Don't let the good round fool you. I'm not at all at my best. A few things clicked and it was fun." He was 0-2 in France at the Ryder Cup. "I had two terrible weeks at BMW and the Tour Championship," Mickelson said. "But I've become a great putter week in and week out with a few bad weeks as opposed to in the past I've kind of an average putter with a few spikes. I'm back to putting well again and rolling it in the way I did all last year." Straka birdied the final three holes for a 63. The Austrian played alongside Mark Mulder, the former major league pitcher who opened with a 75. "I really wasn't expecting that right out of the gates," Straka said. "But I had a good game plan and I just tried to do it shot by shot. I really didn't do a lot of special things. My putter was really hot, and I putted the ball really well. Other than that, you know, I just took advantage of my chances." Chase Wright had a 64, playing the last three holes in 4 under with an eagle on the par-5 16th and two birdies. He's playing in his second career PGA Tour event after earning a card in the Web.com Tour Finals. "It's been a great year," Wright said. "I know I should be here and I'm not by any means surprised about this. My last two competitive rounds were 64, so I think if I keep that up I'll be just fine." Brandt Snedeker, Alex Prugh, J.T. Poston, Mackenzie Hughes, Sam Saunders, Sungjae Im and Adam Long shot 66. "I just stayed patient," said Snedeker, who had an opening 59 in his Wyndham Championship victory in August. "I just kind of worked my way back into after not playing for the past four weeks and getting some rest. I was driving it great all day." Two-time defending champion Brendan Steele had a 67, playing alongside Mickelson. Fred Couples, the Hall of Famer who turned 59 on Wednesday, had a 73 in his first PGA Tour round since the Masters in April.